Twice a year the action sports industry comes together to showcase and display what they have in store for the upcoming year. ASR, the Action Sports Retailers tradeshow, brings together not only the big players of the action sports industry, but gives up and coming brands the opportunity to launch their brands to the industries who’s who. One major difference that’s notable this year is the absence of the major footwear companies. Brands such as Sole Technology (Etnies, ES, Emerica), and Globe have opted out of attending the show. Being that ASR is heavily influenced by skate and surf brands, the absence of these brands is quite apparent. But this may be a grand opportunity for other brands to step up and shine in their place. With such a void of the presence, other themes and brands are catching people’s attention. Noticeable surf brands that were showing what they could bring to the table were your obvious contenders, Quik, Bong, Hurley, Volcom, and Lost. There were a lot of other notable brands that also were making an unexpected presence at the show as well. Smaller brands that focus on surf like Ezekiel, Lost, and Fox all made the push to showcase their spring lines. Since the main focus of the show is to highlight the spring lines, there was no shortage boardshorts, swimwear, walkshorts, tanks and tees. 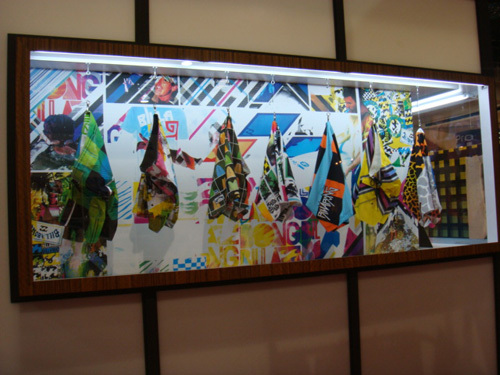 Bright colors and geometric graphics still prove to hold strong and look to continue through until next year. Neons and fluorescent colors seem to still highlight the slimmer shorter silhouettes of boardies and shorts. Always leading the pack and pushing the envelope with the boardshorts is Billabong. All the boardshorts on display looked to be leaning toward the shorter length, veering away from the standard over the knee boardies that have been the standard in the industry for many years. Jumbo all over graphics, mixing geometrics with animal prints, the Billabong assortment proved to be new and exciting while stilling to their roots as clean and wearable boardshorts. One notably cool disply on the ASR floor was the Quiksilver compound. They had a total of 4 booths at the show to exhibit their range of men’s, core, and woman’s divisions as well as a full set up for Roxy. Between this massive layout they displayed their timeline in boardshort history. 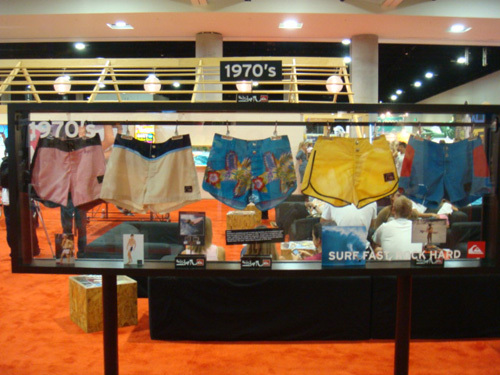 The lounge exhibit held cases of boardshorts from the 70’s, 80’s, 90’s and today to give buyers and visitors a like a brief history not only of what Quiksilver has brought to the surfing community, but how it shaped and set the standard for the industry throughout time. Most interesting of all was to see how the styles of today can truly be accredited to how things use to be as fashion has seem to come full circle within action sports. Though the show was much calmer this year, there was nothing subdued about the brands and activity that was still in attendance. It will be interesting to see how the industry moves into the Fall 2009 season. This week the east coast gets a taste of what is to come for the Spring 2009 season as we move to Orlando, Florida for Surf Expo. Posted by Megan	on Tuesday, September 9th, 2008	in Industry. DC and Nike were at the show…Nike was center floor and DC had a very large room in the back on the middle floor.